We are excited to be playing the 19th Annual Brewgrass Festival in Asheville, NC. See details. 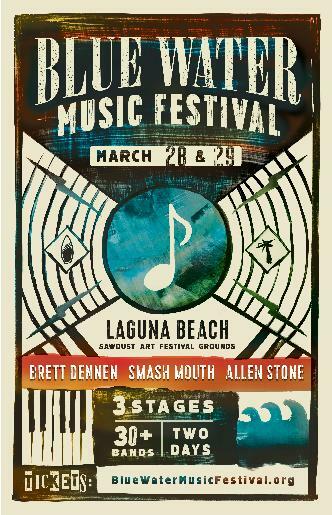 Truth & Salvage Co. is proud to be playing the Blue Water Music Festival in Laguna Beach, CA on March, 29th 2015. 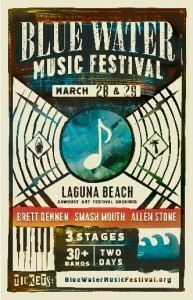 30+ BANDS, 3 STAGES, 2 DAYS. First fully independent release from roots rock band with Black Crowes ties; inspired by the history and vast terrain of eastern New Mexico, where T&SCo guitarist’s father (who co-writes) grew up a wildcatter’s son and a “crusty” rancher’s nephew. ASHEVILLE, N.C. (Tue. Nov. 18) — Truth & Salvage Co. is set to release a new single called “Black Ribbon Highway” on Tuesday, December 2, 2014. Co-written by guitarist/vocalist Scott Kinnebrew and his father Michael Kinnebrew last year, the song was inspired by the elder Kinnebrew’s adventures as a youth splitting time between oil prospecting with his “wildcatter” father across East Texas and being “schooled on the hard-working ranch of a crusty, homesteading, cowboy uncle,” as he describes it, on the plains of eastern New Mexico. Watch a preview of the new song here: http://bit.ly/TSCo_BlackRibbonHighway_TeaserVid. 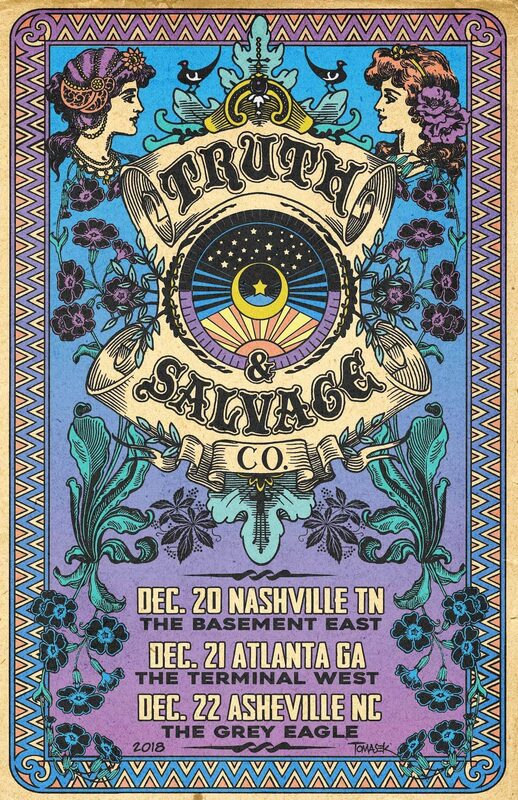 For more information and to stay up to date with Truth & Salvage Co., please visit www.truthandsalvageco.com, www.facebook.com/truthandsalvageco, www.twitter.com/truthandsalvage, and www.youtube.com/user/truthandsalvageco. Shows with Bruce Hornsby and M.O.E. Truth & Salvage Co. plays with M.O.E. at the 4th of July Festival. Click here for TOUR DATES to find out more info! 6:00 p.m. – Truth & Salvage Co.
We haven’t been in touch for awhile and wanted to let you all know about just a handful of dates we’re playing this spring. See the end of this post for ticket info! First, if you happen to be in the Columbus, GA, area TONITE, Tim is playing a solo set at the Loft, more info at TheLoft.com. Tim is also playing solo this Saturday the 10th at the Do317 Lounge in Indy, more info at Do317Lounge.com. Scott just finished playing some solo dates as well, check out his goings-on at scottkinnebrew.wix.com/scottkinnebrew. On May 17, Tim, Walker, Smitty and Dean are appearing with Carl Broemel from My Morning Jacket to perform Truth & Salvage and Broemel tunes alongside some choice covers to honor a fallen mutual friend at the Double Door in Chicago. Local H and Split Single (featuring Britt from Spoon) are also playing, so if you’re in the Chicago area that weekend please try to get tix for that one! It would mean a lot to us and to the beneficiary family to see you there. Then Truth & Salvage proper fires back up in Greenville on Friday the 23rd! From there we’re pleased to be hitting the Long Creek Music Fest again this year on the 24th, and then we’ll return to Asheville on the 25th where we’re playing a new venue for us, the LaB. Supercool chunk of Carolina shows! After that we’re back in Nashville doing a little recording, which we’ll report back to you on soon but we’re definitely excited to be back studioin’ together for a couple days in Music City. On Wednesday the 28th, we’re thrilled to be appearing at the legendary Bluebird Café in Nashville, where we’re doing something we’ve never done before, an all-acoustic “In the Round” set where we’ll tell the stories behind all your favorite T&S tunes. Only 15 tickets left so if you’re thinkin’ about trekking to town for it, better make it happen right quick! We finish this run with a great Eddie Owen Presents benefit for Songs for Sound outside of Atlanta at the Red Clay Theatre on the 30th, and then a return to Tupelo and the thankfully just-reopened Blue Canoe on the 31st. A brief tour to be sure, but one we’re really looking forward to! We’re thinking about some shows in the West later in the year but as of right now we don’t have any other shows planned, so if you’re around for these May gigs we’d really love to see ya at ‘em! Hope 2014’s been great for everybody so far, and here’s to an even better second half of the year. See y’all real soon! 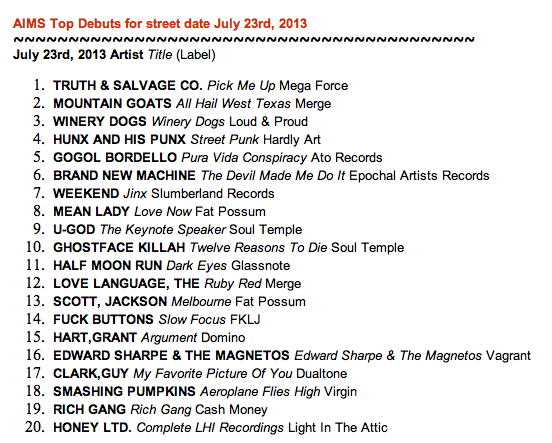 Debuting #1 Thanks to You! WE CAN’T THANK OUR FANS ENOUGH!!!! THIS IS ALL BECAUSE OF YOU!! !